The story of William and Catherine Booth and the Salvation Army. What followed makes an enthralling story of spiritual passion, courage, and faith leading to the birth of The Salvation Army. Young people, often as young as 18, opened the Army's evangelistic work in mining towns or even new nations and the Army expanded globally. The Army's social work was born, compelled by love, reaching out to prisoners and downtrodden. Teaming up with journalist WT Stead, the Army tackled the sexual trafficking business that entrapped hundreds of young girls. This DVD features 11 historians and storytellers, voice artists, period music, over 500 images, rare archival footage, and recordings from two Booth grandchildren. 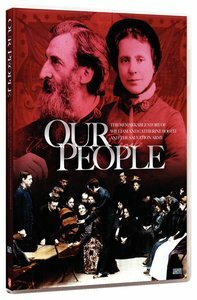 About "Our People: The Story of William and Catherine Booth"